Dropi cod liver oil is exclusively cold processed to maintain all its natural properties. The oil contains pure and natural vitamins, omega-3 and other nutrients. No artificial ingredients are added. 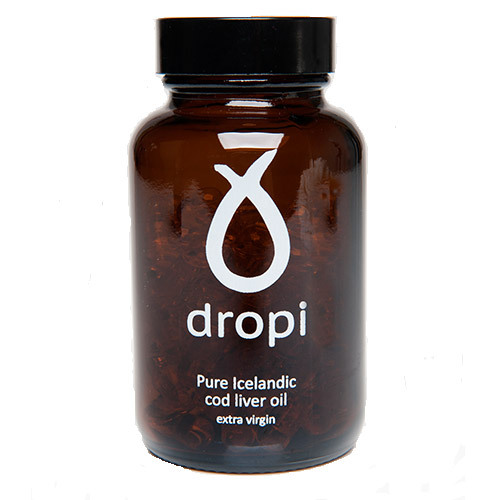 Dropi cod liver oil is made from fresh Icelandic cod (Gadus morhua), caught daily from the clean fishing grounds of the North-Atlantic Ocean around the deep fjords of Westfjords in Iceland. 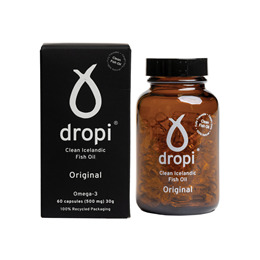 Dropi oil is produced in a very gentle way and the idea is based on the old tradition. Low temperatures are used in the process to maintain all the natural properties of this valuable oil, therefore we can consider dropi extra virgin cod liver oil a RAW food. Early in the morning fishermen in Bolungarvík bait their fishing lines before they sail out to the fishing grounds on their long liners and jiggers. Later in the day the fishermen return to harbour with their fresh catch. The fish is the cured and the liver removed for oil processing. 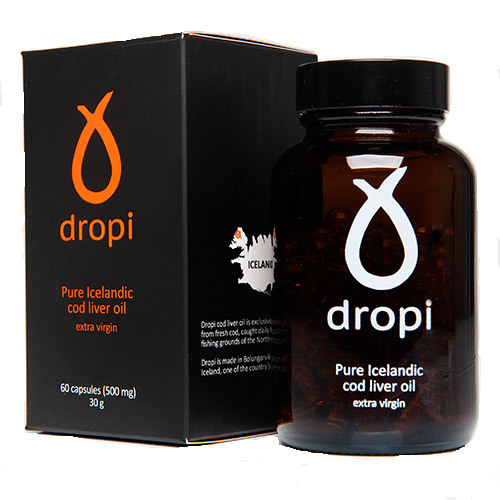 Dropi cod liver oil is of the highest quality as 25% of the oil from Icelandic fish is omega oil. Our quality standards are according to EU directives. The Westfjords are an industrial free zone. Since the very beginning we have worked in close cooperation with Matís, Icelandic Food and Biotech R&D. This quality product is produced according to European standards of Good Manufacturing Practice (HACCP). Cod liver oil, traces of natural antioxidant rosemary extract oil and natural vitamin E. Capsules contain 100% fish gelatin. Take 2-4 capsules daily or as directed by your healthcare practitioner. Food supplements should not be consumed instead of a varied diet. Store at room temperature (15°C – 25°C). if you are pregnant, lactating, allergic to fish, or suffering from chronic illnesses please consult your healthcare practitioner. Below are reviews of Dropi Extra Virgin Cod Liver Oil - 60 x 500mg Capsules by bodykind customers. If you have tried this product we'd love to hear what you think so please leave a review. Really pleased to find a product of this purity. I have been disenchanted with other products purporting to be Cod Liver Oil but find on the label they are made up of "marine oil", whatever that is, mixed with other things. Dropi is expensive but still cheaper than a doctor's visit. My family take it to support good health. What a wonderful product, I researched all cod liver oil for months, this is the very best. Take it on an empty stomach first thing in the morning to avoid that reflux. You really can't buy better. Lovely taste, family happily take this, and I love the oil. When you want a pure product, this must be one of the closest next to eating the liver I have found. Happily recommending this to patients. Dropi cod liver oil is exclusively cold processed to maintain all its natural properties. The oil contains pure and natural vitamins, omega-3 and other nutrients. No artificial ingredients are added.